The movie theater biz has changed dramatically since I abruptly lost my 12-year gig as The Parkways publicist/programmer on March 22, 2009. For one thing, 35mm prints are pretty much obsolete nowadays, from what I understand. Digital projection is the rule, and The New Parkway, for practical purposes, will be no exception. Due to the high costs of storing and shipping film prints, most major studios simply are no longer trafficking in that traditional but obsolete format. 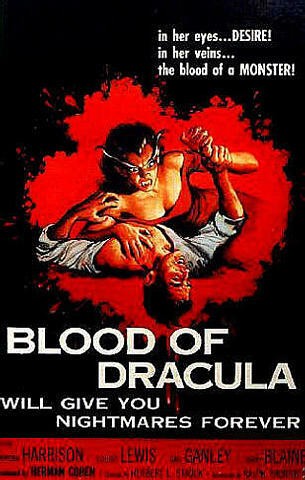 New releases are commonly distributed in something called DCP - Digital Cinema Projection - while repertory (old) movies are generally projected via DVD or Blu Ray. Technology tends to constantly advance, and if a business wants to survive in a rapidly evolving industry, it adapts or dies. It's that simple. Back when I was programming the old Parkway, we showed mainly 35mm prints, and eventually added a DVD player (though hardly a state-of-the-art projector), for locals films, private parties, as well as for our infamous introductory promo videos (remember, I was "the white guy"). 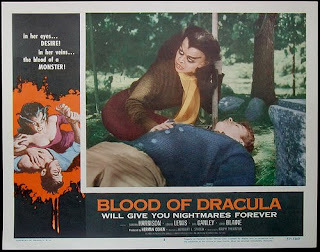 Early on in my so-called "career," in the spring or summer of 1997, one of the first movies I booked for The Midnight Lounge (which eventually became Thrillville) was a personal favorite called Blood of Dracula (1957), the female flip side to I Was a Teenage Werewolf and I Was a Teenage Frankenstein from the same year. 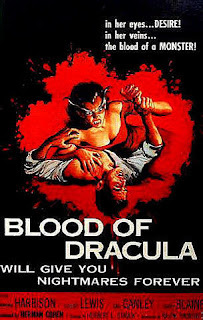 These films, along with 1958's How to Make a Monster, all from the innovative, influential studio American International Pictures, basically invented and inaugurated the whole teenage monster genre that was successfully rebooted in the 90s with Buffy the Vampire Slayer. Anyway, I was lucky to score this rare print, from the now defunct distributor Kit Parker Films, without having reel-to-reel capability. The print was in pretty decent shape, too. The only problem was the projectionist confused reels two and three and built them up out of order. There were only four reels, so basically half the movie was out of order. We won't be testing the audience's plot awareness at The New Parkway. Cheers.